Antibiotics are finally starting to kick in a little, so I should be back up and running in plenty of time for the New York Comicon in a couple of weeks, where we’ll be featured on a TwoMorrows Panel on Sunday, April 20 at 1pm. There also likely will be a Kirby Tribute Panel in NYC that I’ll be on (thanks to moderator Mark Evanier), where I’ll be plugging the stink outta K-5-0. I’ll also be taking part (via phone, along with the aforementioned Mr. E) in a big trans-atlantic Kirbyfest in England on April 15, thanks to Jack Kirby Quarterly’s Chrissie Harper (more details shortly). So don’t count me out yet! This entry was posted in TNT on 31 March 2008 by Mr. Morrow. It’s finally done. KIRBY FIVE-OH! (the double-size book that’s the 50th issue of the Jack Kirby Collector) is finally to press. Me… am… tired. It should be shipping around April 18th, hopefully just in time to debut at the New York Comicon, where we’ll have a primo booth, right up front of the Javits Center. I think I’ll be awake and recovered by then. If not, please don’t kick me while I’m napping under the tables at our booth. Oh yeah; the book is really, really, really, really, really, really good. Really. This entry was posted in TNT on 24 March 2008 by Mr. Morrow. Back in the early 1970s, Jack Kirby was invited backstage to meet Paul and Linda McCartney at a Wings concert in LA. 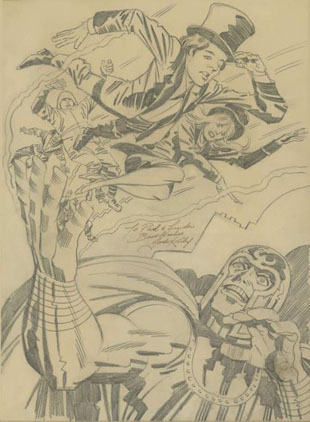 For the occasion, Jack drew a really nice illo (below) of Paul and Linda with Magneto, and we did a write-up of the event (courtesy of Gary Sherman) in The Jack Kirby Collector #43. George Khoury just called me with sad, sad news. Dave Stevens passed away yesterday, at a much too young age. Fans of course know him as the creator of the “Rocketeer”. I knew him as a guy who was always a lot of fun to talk to; a lifelong Jack Kirby fan, so we always had that in common the times we spoke. I don’t have to tell anyone familiar with his work what an incredible talent he was, or anyone who knew him personally what a nice guy he was. My favorite memory of Dave isn’t exactly related to comics. We were talking by phone late one evening a few years ago, waxing about Kirby’s art, and I happened to mention how much chocolate I consumed working on each issue of the Kirby Collector. Dave mentioned that he grew up in Oregon, and as a kid, he used to wolf down massive quantities of a little-known regional confection called an “Idaho Spud Bar.” He said it looked sorta like a chocolate-covered potato; not the most appetizing image, mind you, but he assured me it was awesome, at least to a kid’s palette. Always looking for a new chocolate experience, I asked where I could find them, but he was pretty certain they’d stopped making them years ago, and it was only available in the Northwest then anyway. I couldn’t resist helping out a kindred cocoa-spirit, so later that week, after several Internet searches, I tracked down a mail-order site that had Idaho Spud Bars for sale, and had a box sent to him. This was about a week before the San Diego Comicon that year, and when I got to the hall, I stopped by his booth, and we had a great laugh about the package he’d gotten in the mail. They must’ve still tasted pretty good to him, cause he’d already eaten the whole box before the Con (he didn’t even save one for me!). 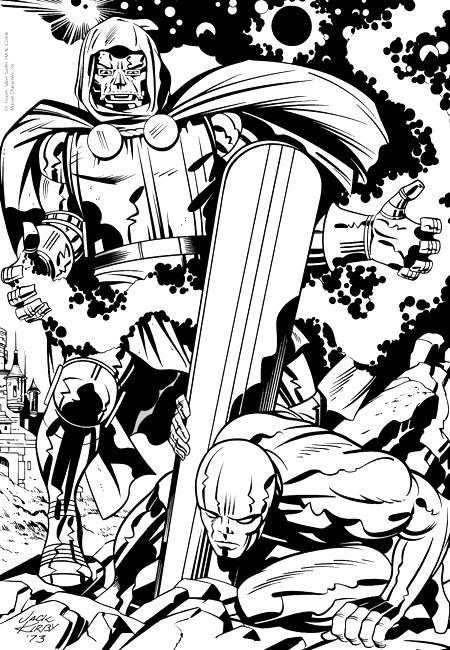 Dave inked a number of Jack Kirby pieces that I’ve used in TJKC over the yearsâ€”many done as a teenager. My favorite was the centerfold of issue #19, of Captain America and Bucky in a WWII scene (you may remember the Kirby pencils from Steranko’s History of Comics Vol. 1). Nobody cared that he drew as slowly as he did, because the end result was just so astonishingly good. He let us use a number of his illos and paintings in our mags over the years, and was a big supporter of what we’re trying to do for fandom. Most recently, he offered up an amazing Phantom Lady commission he’d done, as cover art for a book that’s in the planning stages. I don’t really know what else to say about Dave. I hate that we’re losing so many comics greats, especially ones so young and so talented. Just look at this amazing job he did inking Kirby, while still just a teenager. Simply amazing. This entry was posted in TNT on 11 March 2008 by Mr. Morrow. Spotted at Barnes & Noble! 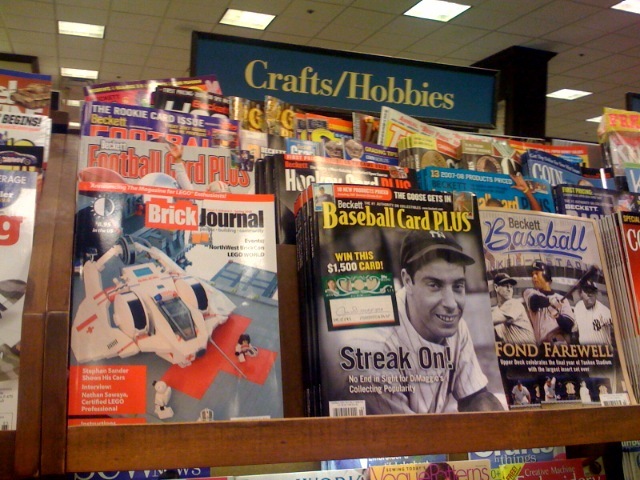 So issue #1 of the magazine for LEGO afficiandos is now out in B&N stores around the globe! If yours doesn’t carry it, be sure to ask them to start with issue #2. This entry was posted in TNT on 10 March 2008 by Mr. Morrow. FF: The Lost Adventure is finally out! Way back in 1996, in Jack Kirby	Collector #9, I pieced together the original version of what was meant to be Fantastic Four #102. Some of the original story ended up as a framing sequence in FF #108 (mixed with John Buscema pencil art), after Kirby had left Marvel for DC Comics in 1970. I had a bunch of chopped up Kirby pencil pages and panels that were never used, and combined them with the Kirby panels that were used in #108, and put the story back into (more or less) the original version Jack had drawn. Since 1996, the unused #102 splash page, and copies of most of the pencils from the #108 stuff, have turned up, so we had the story almost totally complete in pencil. Enter Marvel’s Tom Brevoort, who got the great idea of having Stan Lee dialogue the unused story, and Joe Sinnott ink it. So, after making sure the Kirby family would be getting paid for the use of Jack’s art, I sent it all to Marvel. The end result is Fantastic Four: The Lost Adventure, which is in stores now. It presents the unused pencil version, the inked/dialogued version, and the story that ran in FF #108. Yes, it’s a missing page from that unused story. A Kirby fan copped this low-res scan off of eBay back in 2004, when someone was selling it. We don’t have record of who actually bought it, and it may have changed hands since then. 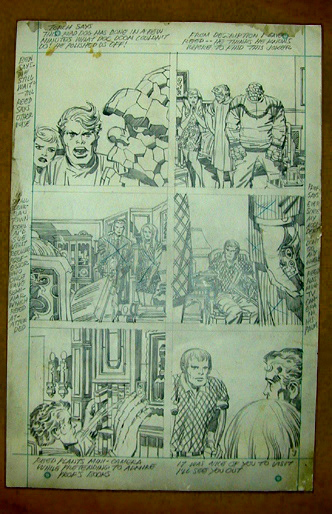 If we can find a good scan of this pencil page, Joe Sinnott has agreed to ink it for us to run in the Jack Kirby Collector. So if you know who has it, or have a scan or xerox of this page, please get in touch with me at twomorrow@aol.com. I really want to see Jack’s final FF story completed, once and for all! This entry was posted in TNT on 6 March 2008 by Mr. Morrow.